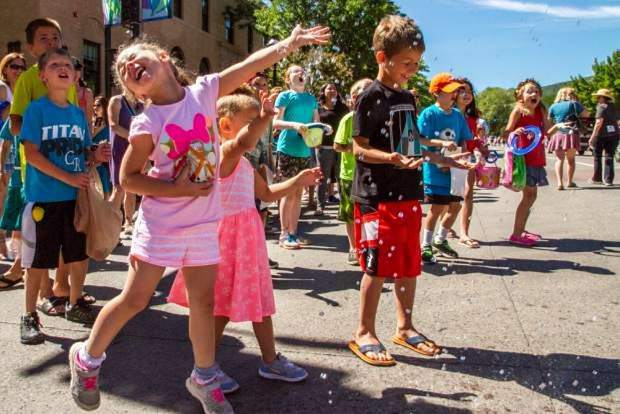 Children enjoy being sprayed with water during a past Strawberry Days Parade in Glenwood Springs. This year marks the 121st anniversary of Strawberry Days, a festival known for carnival rides, strawberry ice cream and local arts, crafts and food vendors. The fair this year will be unaccompanied by the carnival, though, which for nearly a decade took place outside the Glenwood Springs Mall in West Glenwood. For reasons unknown, the mall opted not to host the event this year, and the Glenwood Springs Chamber Resort Association was unable to find an alternative location. “While we know the carnival will be missed, we’re excited to offer a wide variety of fun entertainment and activities at Sayre Park,” GSCRA President and CEO Angie Anderson said. “Additionally, Glenwood Caverns Adventure Park is another great alternative to the carnival, offering thrill rides, kid-friendly attractions, a family-friendly melodrama, dining, spectacular views and tours of Glenwood Caverns and the Historic Fairy Caves,” she suggested. And the Caverns is helping to make that happen for festival weekend. On Friday, the Caverns will provide free tram rides to the top of Iron Mountain after 4 p.m. for the Friday Afternoon Club on the Mountain. Coupons will be available in that day’s Glenwood Springs Post Independent. Strawberry Days festivities officially begin at 6 p.m. Thursday with the poolside Miss Strawberry Days Fashion Show at the Glenwood Hot Springs. Tickets to the fashion show are free and available for pick-up at the Glenwood Springs Chamber Visitor Center, and at the Glenwood Hot Springs the evening of the event. The festival itself opens at noon on June 15 in Sayre “Strawberry” Park. It will feature several longtime vendors, including Dionysos Greek Foods, Mr. Lemonaid, O’Hara’s Jams & Jellies, Old Tyme Kettle Korn and Walden Watercolors. Though not directly related to Strawberry Days, on Friday morning volunteers from the Noon Rotary Club will take over the annual Pie Day at the First United Methodist Church on Cooper Avenue. The event for many years had been put on by the Valley View Hospital Auxiliary, until that organization disbanded last year, having fulfilled its long-standing mission, according to the group. Miss Strawberry Days will be crowned following the introduction of the princesses at 6 p.m. Friday on the FamilyFest stage in the park. The Strawberry Princess Celebration is sponsored by Once Upon a Child and Murray Dental Group and celebrates the strength and spirit of the Roaring Fork Valley’s daughters. Music on the main stage begins at 7 p.m. with Chris Daniels and the Kings, with Freddi Gowdy. The “Oh the Places We’ll Go” Strawberry Days Parade will begin at 10 a.m. on Saturday at Ninth and Grand Avenue, proceeding south on Grand. The parade will include creative community floats, the Miss Strawberry Days entourage, participants of the Strawberry Princess Celebration, and the 101st Army Band. Following the parade, there will also be the traditional free strawberries and ice cream provided by Safeway and Roaring Fork Sotheby’s International Realty and served by the Kiwanis Club, until supplies run out. The Rotary Club also puts on its annual Pancake Breakfast on Sunday morning. Also Sunday morning will be the 41st annual Strawberry Shortcut 5K, 10K and 1-Mile runs. The 10K starts at 7 a.m. at Ninth and Colorado, followed by the 5K at 8:15. The annual Kiwanis Ball Race fundraiser takes place Sunday afternoon.